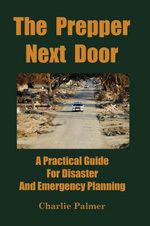 If you’re looking for a good book for new preppers, I recommend Handbook to Practical Disaster Preparedness for the Family by Arthur T. Bradley. Bradley give common sense advice that’s too easy to forget. His cardinal rule: “The cardinal rule to surviving a disaster is, whenever possible, to get out of its way!” This simple rule can save many lives, but many of us want to stay put, even when we shouldn’t. 1) It covers all the basics without any important omissions. 2) It’s well illustrated and well organized. 3) It approaches the topic from a realistic perspective. There’s nothing I really dislike about the book.